Advanced tread compound with super single weight reduction provides lower rolling resistance. Features 27/32” tread depth, an evolving sipe tread design and closed shoulder. 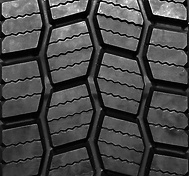 Three-dimensional center sipes increase groove strength for longevity, while allowing more tread block flexibility. Groove geometry designed with stress reduction elements to separate forces and reduce premature wear.